With as many comics and graphic novels as I read (according to Goodreads, 728 and counting), it surprises me when I come across one I haven't heard of before. Let alone an entire series. But that happened last week, when I stumbled upon a book that wasn't on my radar, but I love both as a teacher and as a human (those things don't always coincide). Hereville: How Mirka Got Her Sword manages to combine feminism, Orthodox Judaism, humor, adventure, and myth all in one graphic novel. Mirka is an eleven year old Jewish girl living in Hereville. She's got a stepmother who's always on her case, an older sister who's pushing marriage on her as hard as the opening act of Fiddler on the Roof, an annoying younger brother, and seven (count them, seven) little sisters/stepsisters. The brother Zindel is the most important one for this story, and the other siblings are just bit players. Mirka, who spends too much time knitting and debating her stepmother (who switches sides of an argument at whim to play devil's advocate) for her taste, wants to be a dragonslayer. She's told she shouldn't, she can't, she's a girl, she should be focusing on other things--but she knows what she wants to do with her life. When she comes across a witch's house, she sees her chance to use some magic and some luck to take her further along the path of becoming a dragonslayer. The book does a good job of introducing the fantastic without it seeming outlandish. That there's a witch in Hereville, that there are dragons and demons, seems ordinary to the characters, so it's ordinary to us. That doesn't mean they're not frightening. I've seen Mirka described as a feminist, which is a loaded term these days. Actually, has it never not been a loaded term? In this case, it seems to mean three things: first, that her older sister's obsession with marriage comes across as silly to Mirka. She knows it's important, but it will come along if it comes along -- it's not the highest thing on her agenda. The second is that Mirka stands up to bullies. She does it for herself, she does it for Zindel. She's strong enough and self-assured enough to take a stand. The third is seen in those arguments with her stepmother -- she's quick-witted, and even though she feels frustrated and shut-down sometimes, she's learning to speak up for herself, and not be cowed by the authoritarian figures in her life. I don't necessarily see those three things as being exclusively "feminist," but I do think in "traditional" households, they're traits that are encouraged more in our sons than our daughters. And traditional in this case can mean an Orthodox Jewish household, but could just as easily be Catholic or Muslim or Mormon or Evangelical Christian. 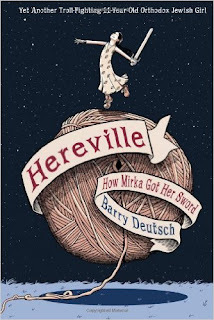 The traditions of Orthodox Judaism take center stage in Mirka's story, and author/artist Barry Deutsch does a good job of explaining these traditions to the gentiles in the reading audience. The dialogue has frequent yiddish words and phrases, and while most of them are understandable in context, there are footnoted definitions of each of them as they're introduced. There's a Shabbos/sabbath celebration midway through the book, and each of the parts of the preparation for and celebration of the day are lovingly introduced. 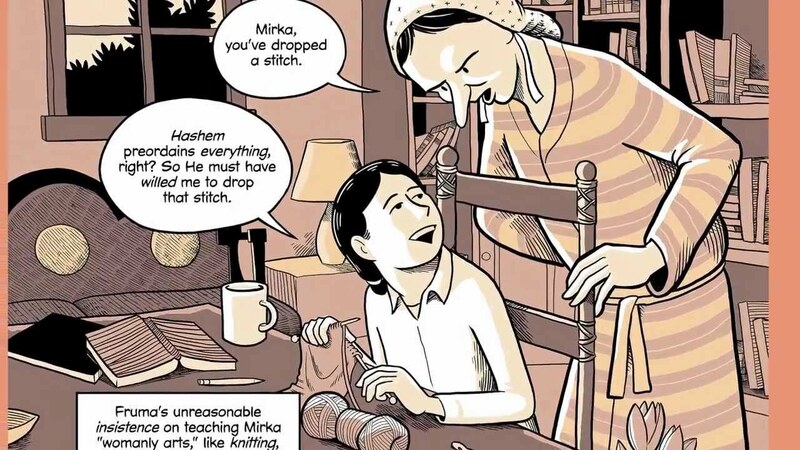 There are a few elements I'd classify as "supernatural" in different parts of the book, and I don't know if they're part of Jewish tradition or are just inserted by Deutsch as part of Mirka's adventure. In either case, they add an element of the mystical, of something larger than our day-to-day life at work. What I liked best about the traditions included in the book is how Mirka approaches them. So many books telling similar stories have the teen/tweenaged child resenting religious tradition, rebelling against their parents, hating religion, discounting spirituality. Mirka, though irritated at some of the chores involved in preparing for Shabbos, finds joy in the traditions and celebration. I loved seeing that. It's refreshing to see the other side of that story, and (again) whether Judaism, Islam, or Christianity, it gives the religious kid something to identify with. All told, this was a fun book, appropriate and enjoyable for elementary and middle school students. 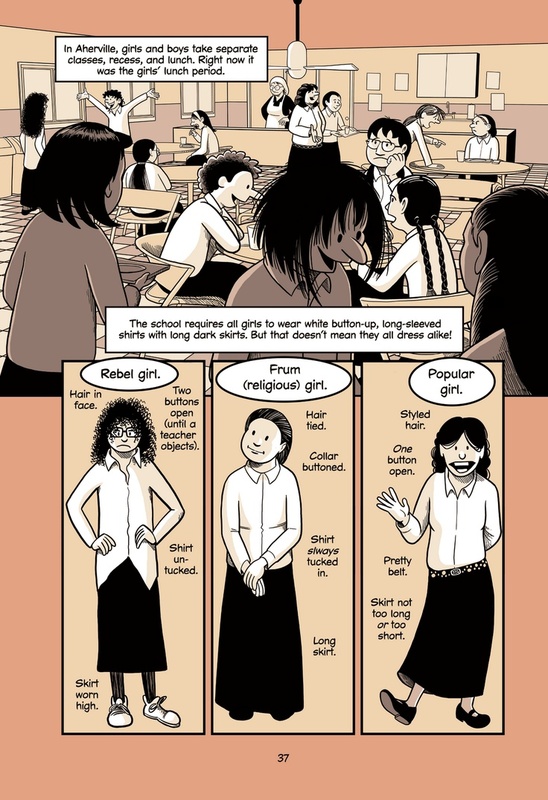 Mirka's a new kind of heroine, and even though this book was first published in 2010, it's readily available online and in bookstores, and should be part of every school library. There are two sequels I haven't read yet (How Mirka Met a Meteorite and How Mirka Caught a Fish), but they're high on my to-read list now. I want to see what happens next.